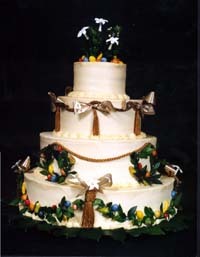 Our wedding cakes are made to order from the finest fresh ingredients: fresh eggs, unsalted butter, and 40% heavy cream. Our buttercream icing is made with unsalted butter. 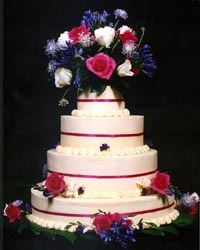 The taste is very rich and buttery, not greasy or overly sweet.The fragile nature of the buttercream limits the use of elaborate icing designs to simple borders between tiers and prevents the cake from being displayed outdoors. 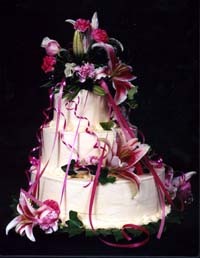 We decorate our cakes with fresh flowers and ribbons. 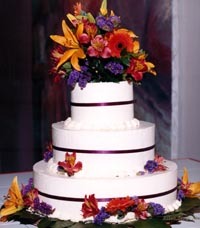 We will coordinate the flowers with your florist to fit your overall theme and style. 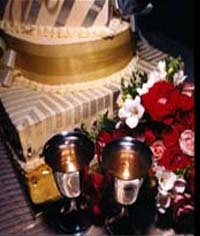 Any other decorations or props should be provided by you and must be in our possession two weeks prior to the wedding. 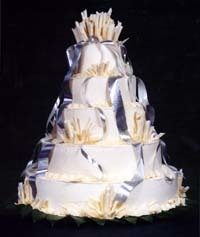 Our tiered cakes are stacked directly on top of each other, using internal supports. No dividers or columns are used. 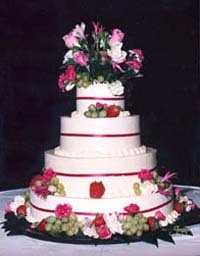 Once you have chosen CRAVINGS GOURMET DESSERTS to bake your wedding cake, your next step will be to set up an appointment. The meetings generally last 20 to 30 minutes and should be arranged a minimum of one week in advance. Weekend appointments book quickly. 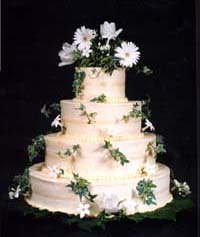 Since we limit the number of wedding cakes we make each week, please order early and send a deposit to secure the date. 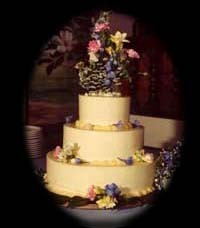 At the meeting you will be shown a portfolio of wedding cakes and discuss at length the details of you particular wedding. 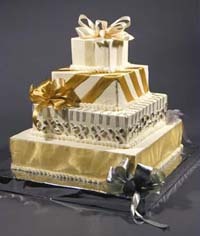 You can also visit the online wedding cake portfolio. 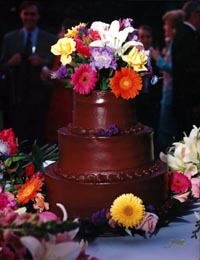 A preliminary guest count - a final count is required eleven days before the wedding. The florist's name, phone number, and the name of the contact person for your wedding. The reception location, phone number, coordinator's name, and the time of your reception. A non-refundable deposit of $100.00 (cash or check) to secure the date. 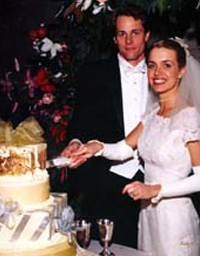 The balance is due seven days prior to the wedding. A credit card number will be kept on file as a security deposit for the baseboard. You will be charged $75.00 if the baseboard is not returned or is damaged. $50.00 **additional fees may apply based on location and distance. 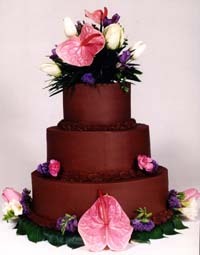 Grooms cakes are also available at the above prices. 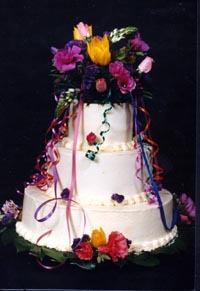 Special Requests or Unique Designs are available at an additional fee. 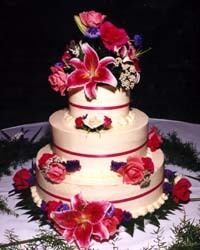 Test a combination that appeals to you and be sure that it is perfect for your wedding day. 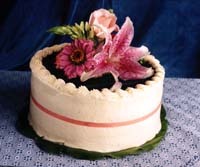 Sample cakes are 6" in diameter and yield 6-8 slices. 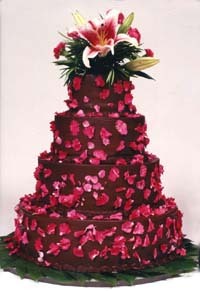 Please allow a week's notice when you are ordering a sample cake. 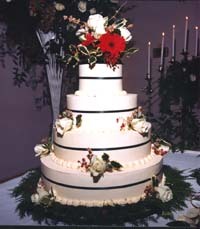 The cost for sample cakes is $25.00 each, plus tax and delivery. Tastings are available for a cost of $50. 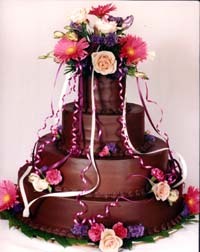 If cake order is placed, cost will be put towards payment. 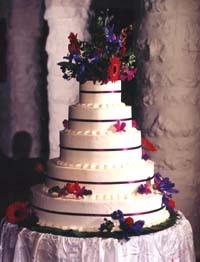 Cake, Filling and Frosting Options are the same as our Layer Cakes.